Mediumship Empowerment ~ a Playful Day Long Workshop! Introducing the Dragonfly "Your Telephone to the Other Side"
LIMITED Space and these seminars sell out fast! * Gain personal clarity and a deeper understanding of who you are. * Write your own path to freedom and take command of your life. * Discover how to overcome any fear you have ever had. To register: Please call 604-792-3730; email info@amethystbookstore.com or come into the store (8989 Young Road). Seats are limited and its usually a full house! 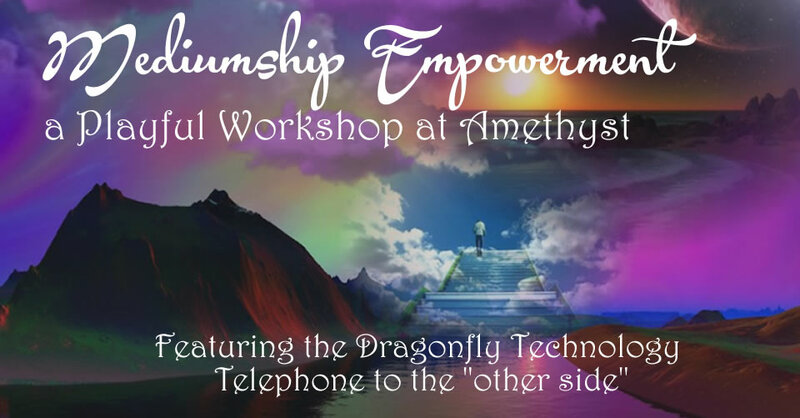 Join us to experience a brand new Mediumship Technology called The Dragonfly. Hear messages your spirit guides and passed loved ones want to share with you. Come with your questions, what do you want to know? Ask questions, hear the answers ~ it's up to you to decide/discern a conclusion. Richard Raynault and his co-facilitator, Harsha will lead you through this worshop!.